Amy Tara Koch | Why Binge Watch GOT When You Can Stay In A Real Castle? 12 Jul Why Binge Watch GOT When You Can Stay In A Real Castle? Mother of Dragons has left Meereen for Westeros. Lade Olenna is making alliances in Dorne. Cersei has taken the helm over Kings Landing and suddenly cookie cutter hotels feel tragically bland. Game of Thrones is back (July 16). And, the battle for the Iron Throne has inspired a real world thirst for vacations in crenellated castles with settings befitting a proper film set. That guests can partake in old world ”leisure pursuits” (think deer stalking, clay shooting, archery and falconry) makes a trip to these pedigreed properties all the more alluring. Turrets, a moat and refined interiors (the hotel had a $75 million renovation in 2015) impart this 13th century Anglo Norman castle in western Ireland with historic charm and modern -day panache. It’s heritage– the castle was owned by the Guinness family and visited by luminaries such as King George V, Oscar Wilde, Ted Kennedy; Prince Rainier III of Monaco and Princess Grace (The Quiet Man with John Wayne was also filmed on site) – heighten the five star property’s glamour quotient. From the estate’s 350 acres of ancient woodlands, guests have access to clay shooting, horse riding, kayaking and fishing (brown trout, salmon and pike are abundant) as well as boat trips on the Lough Corrib. Falconry (Ashford is is home to the oldest falconry school in Ireland) is a highlight. Take a “hawk walk” while birds of prey gobble raw chicken from your protective glove. Food is sumptuous. Fine dining is an option. Or, a pairings dinner can be organized in the wine cellar (a former secret passageway). After a day of sporting, some may want to simply kick back with whiskey and tapas in the Billiards Room. Not only are there battlements and a castle keep, Dromoland has a rare claim to fame: it can directly trace it’s lineage all the way back to the O’Briens, Barons of Inchiquin, royal descendants of Brian Boru, High King of Ireland who ruled from this Viking stronghold in the eleventh century. Inside, you’ll find decidedly better-than-Medieval decor: lush window treatments and wall coverings, chintz furniture, luxurious bedding, Waterford chandeliers and walls adorned with art and an an impressive array of stag’s heads. On the estate’s wildlife-filled grounds, guests can sign on for falconry, archery, tennis, trout fishing, horse riding and clay pigeon shooting. There is also an18 hole golf course. Take in the otherworldly Gaelic landscape with a drive along the rugged coastline to the Cliffs of Moher, Limerick and The Burren. Dining is equally five star. Choose from the ritzy Earl of Thormond for fine dining or a more low key meal (in front of a roaring fire, natch) in the Drawing Room or The Gallery. 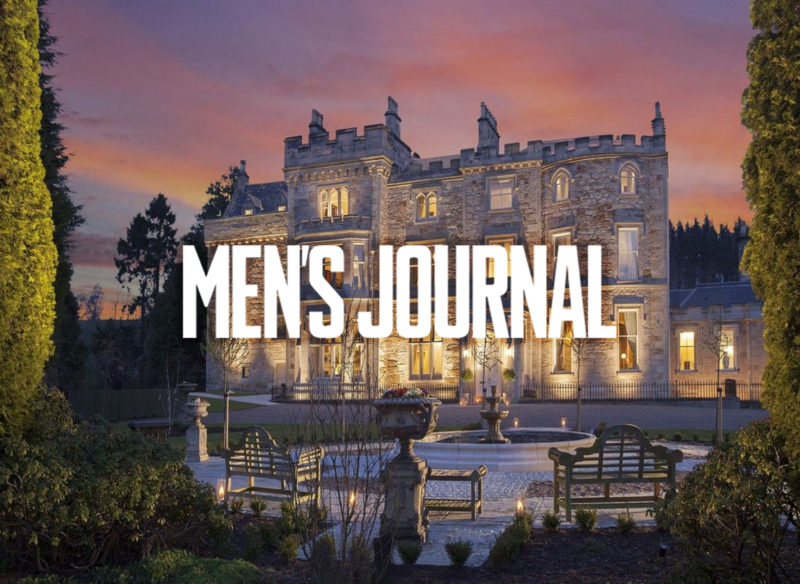 In the Scottish Highlands, this stately private residence turned hotel (admired by Queen Victoria when she passed through in 1873 en route to Balmoral) is at once luxurious and deeply romantic, a beneficiary of the surrounding mystical-looking glens, lochs and crumbling fortresses. The 17 rooms, outfitted in various luxe iterations of tartan- feel more country house than castle. But the dining rooms are grand. While nibbling locally sourced cuisine (acclaimed chef Albert Roux and his son Michel Roux, Jr. oversee all of the properties in Inverlochy Castle Management International portfolio) -salt baked rooster, loin of Highland venison, glazed Shetland salmon-you’ll sit on period furniture presented as gifts to to the estate’s first owners from the King of Norway during World War II. Be advised: jackets are required. Sports’ lovers can try their hand at stalking deer, clay pigeon shooting or fishing for wild brown trout at Loch Blair (the kitchen will prepare your catch) at the nearby Achnacarry Sporting and Country Pursuits, a 75,000-acre estate. The castle’s location at the foothills of Ben Nevis, the UK’s highest mountain, allow for excellent hiking, white water rafting, off roading and mountain biking. Tucked into a woodlands just 35 minutes from Glasgow International Airport this just-refurbished castle is ideal for those looking for an experience more dowager domicile than chi-chi aristo-hotel. With just nine bedrooms, the storied property (one owner was the 19th century raincoat manufacturer Charles Macintosh, inventor of waterproof cloth (1766–1843) feels cozy despite it’s 600 year old history. Rooms are airy and bright with period furnishings and views of the grounds and River Calder. On the recreation front, there are options on and off the property. The nearby Central Scotland Shooting School offers clay target shooting and rainbow trout fishing. Hiking amidst waterfalls and wildlife at the Falls Of Clyde nature reserve is another popular pursuit. The hotel stocks rods for brown trout fishing on the estate. Such close proximity to Glasgow makes it easy for guests to pop into town for theater and concerts at the Glasgow Royal Concert Hall. Like Inverlochy (this castle is also managed by Inverlochy Castle Management International ), the opulent fine dining restaurant is helmed by Albert and Michel Roux Jr. After a day in the countryside, put your feet up in the wood-paneled Drawing Room with a tumbler of straight-from-the-Highlands Scottish whiskey. Across the pond in England, perched on a windswept bluff, is Bovey Castle, the former estate of bookshop mogul WH Smith, (later to become Viscount Hambleden). What the property lacks in age (b. 1890), it makes up for in charm and sporting activities: hot air ballooning, fly fishing, archery, falconry, air rifle shooting and “croft”, a golf/croquet hybrid. There’s more. As the castle sits in the middle of Dartmoor National Park, you can explore the rugged Pride and Prejudice worthy landscape-deep wooded valleys, rivers, flora and fauna-filled hills-by foot, bicycle or horse (the hotel has a partnership with Liberty Trails for cattle drives and a “War Horse” outing to see shoot locations for Spielberg’s film of the same title). You can also hit the Devon coast for kite surfing. For recreation of the tippling sort, guests can also learn the art of sloe gin making on site. There is fine dining based on “classic cookery” (rosette of Devon lamb, fillet of Dartmoor “beef welly”, roast squab pigeon) as well as a brasserie for more casual meals.